Dr. Charles Augustus Peterson practiced medicine in and around Spruce Pine for 52 years. Charles Augustus Peterson was born in Relief 10/01/1882 to Solomon Peterson and his second wife, Julia Edwards. He had 10 brothers and sisters. Charles attended Bowman Academy in Bakersville and taught school for a couple of years in Poplar. However, he wanted to be a physician, so he worked for 2 years – while he was teaching school – with Dr. James Isaac Bradshaw. He attended Dwight Institute in Erwin, TN, as well as Tennessee Medical College, obtaining his medical license at age 23. He also studied medicine at North Carolina Medical College in Charlotte and Davidson. He came to Spruce Pine in 1907. Some sources say he was responsible for building the town’s first brick structure, which housed his practice and Spruce Pine Pharmacy; in later years, Carl Baker’s Men’s and Ladies’ Shop operated in the building. Peterson and Schell McCall Sr. built down the street, and the Pharmacy and medical practice moved there. A memory of their early childhood that will never leave some folks today was the dreaded climb up the stairs to Dr. Peterson’s office above the Rexall Drug Store for a doctor’s appointment! Doctor Charles delivered around 4000 babies during his career, often with the assistance of local midwives; he frequently asked my grandmother, Iva Burleson Gunter, to accompany him to help care for mother and child. The doctor’s fee for delivering a baby was usually based on the family’s ability to pay, as low as $10. An office visit, some recall, was $1 and a house call might be $3. 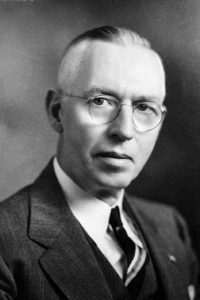 Although he began a quest to bring a hospital to Spruce Pine in 1928, he was not successful until 1955. Doc Charles became its first chief of staff. During one of his five terms in the North Carolina legislature, Dr. Peterson, believing that lethal gas was a more humane form of execution than electrocution, introduced a bill to end the use of the electric chair in capital cases. It became law in 1935. Doc Charles, according to Calhoun, worked hard and played hard. “He loved golf and played most every Saturday. He enjoyed a good game of pool as well as hunting and fishing.” And he kept working long past the age most folks retire; in 1955 he told a correspondent from the Asheville Citizen that “A man who has nothing to do grows old too fast.” He several times refreshed his medical knowledge with graduate courses at New York University and Tulane. 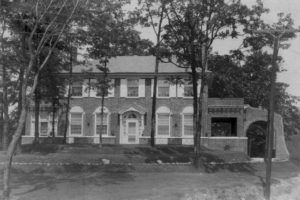 Dr. Peterson and his wife, Norene McCall (1886-1967), built a large brick home on a Spruce Pine hillside; the house still stands near the Spruce Pine Public Library.